Charitable affiliation: World Hope International, to support water well efforts in underserved regions. Next Peak: May 2019, Denali, (also known as Mount McKinley), is the highest mountain peak in North America, with a summit elevation of 20,310 feet. #4 of the 7 summits for me! Charitable Adventure: “Climb for a Cause”, Looking for a new charity adventure outside your local marathon? Challenge yourself while helping others! Join me in the fall of 2019 to trek to Everest Basecamp! Join us on this 12-day guided trek as we travel to the base camp of the world's highest mountain, Mount Everest, in support of water well projects for World Hope International. "World Hope International (WHI), a Christian-relief and development organization that works with vulnerable and exploited communities to alleviate poverty, suffering and worldwide injustices, today announced a partnership with professional athlete and adventurer Sara Hastreiter who has set out to become the first woman in history to achieve sailing the seven oceans around the world and to climb the highest peak on each continent in her 7 Seas / 7 Summits quest for good. To date, Hastreiter has already successfully sailed across all seven oceans and has four peaks remaining– Denali (Alaska), Vinson (Antarctica), Carstensz Pyramid (New Guinea) and Everest (Nepal). Along the way, she has aligned with various charities and dedicated each adventure to a cause close to her heart. In her remaining summits, Hastreiter has selected World Hope as her charity of choice in support of building water wells in underserved regions. This spring, Sara will attempt to summit Denali, the tallest peak in North America, one of her four remaining peaks to complete the world record. Hastreiter will continue the rest of her journey with World Hope beginning with attempting to summit Denali, the tallest peak in North America in Spring 2019 and ending with Mount Everest during Spring 2020. 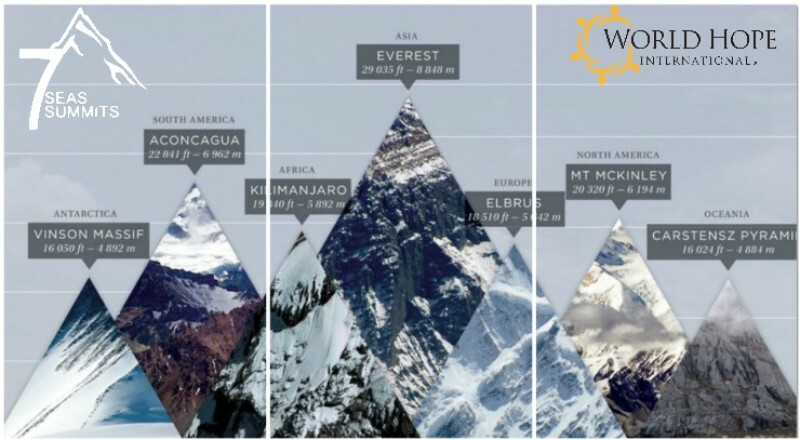 In an effort to raise more money on WHI’s behalf, she will also participate in two Everest basecamp climbs, each with groups of 15 volunteers. This fundraising activity will give friends and families of the volunteers as well as other followers of this challenge and cause an opportunity to donate on behalf of an interactive climb with Hastreiter at the helm of the group. Sara’s unique combination of experiences has provided her with the skills to connect and inspire with a level of authenticity that few share. She holds a degree in African Studies and has worked since an early age to help address the social side of HIV/AIDS, including fieldwork in both Tanzania and St. Croix. Now, whether spearheading her own charitable campaigns or teaming up with organizations like us to provide immediate relief to victims of Hurricane Michael in Florida, Sara continues to demonstrate a heartfelt commitment to improving the lives of those who suffer. Why did I choose 'access to water' as my charitable focus? -An estimated 2.1 billion people in the world are without access to safe drinking water, resulting in the death of more than 800 children each day. When people do not have access to clean water, it jeopardizes their ability to access other fundamental human rights like gaining an education, having an adequate standard of living and enjoying personal security. -Access to clean water frees up time for women to earn an income, which can drive dramatic improvements in household indicators. -Access to nearby water sources helps girls stay closer to home, safer from risks of sexual violence and its life-threatening effects. -Access to appropriate water and sanitation facilities in schools promotes equitable access to education and helps break the cycle of intergenerational poverty. Note: 100% of monies raised before, during and after my climbs will go to support WHI clean water projects. No money raised will go to support my challenge.